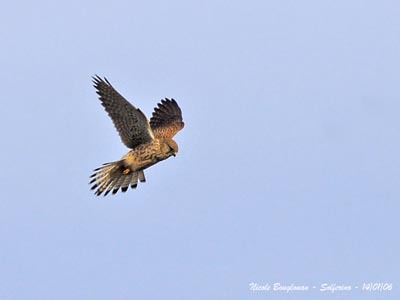 Common Kestrel is one of the commonest birds of prey, often seen hovering above the country while searching for prey. Adult male has blue-grey head with black moustache. The upperparts are reddish-chestnut, heavily spotted with drop-like spots. Rump and tail are bluish grey. Tail shows black subterminal bar. Tail feathers are finely white-tipped. On the wings, primary and secondary flight feathers are blackish. Chin is whitish. Underparts are yellowish-brown, streaked and speckled black. Undertail feathers are narrowly barred and show black subterminal band. The hooked bill is grey and black-tipped with yellow cere. Eyes are dark brown with yellow lores and eye-ring. Legs and feet are bright yellow. Female has browner upperparts with conspicuous dark bars. On the head, crown and nape are brown, streaked darker brown. Tail is brown barred black. Lower back and rump may be bluish-grey. Primary flight feathers are blackish-brown. Secondary feathers are streaked brown. Chick is covered in thick white down. Juvenile is heavily streaked. 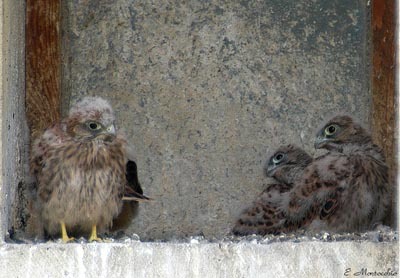 Young get complete adult plumage at 2-3 years, and sexual maturity at one year. They can breed with subadult plumage. We find 11 subspecies sharing the wide range. Races differ in colours, markings, tail pattern and size. 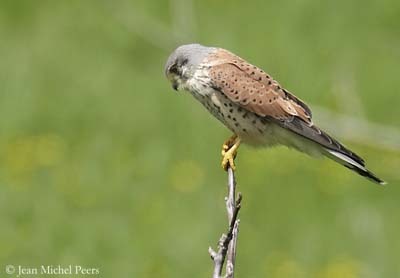 Common Kestrel is vocal during the breeding season. We can hear series of “kik-kik-kik-kik” higher in male. In flight, it gives some “kik-kik”. Alarm call is a high-pitched “kii-kii-kiikii”. 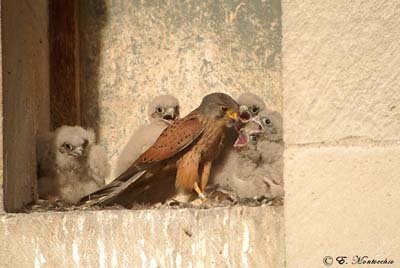 Contact call between parents and young at nest is a repeated shrill “ki-yiyi”. Vocalizations are often one single call repeated in series or not, varied in pitch and frequency, according to the situation. Common Kestrel frequents numerous kinds of open or slightly wooded areas with tall grass and low shrubs such as grasslands, steppes, cultivated fields, wetlands with some vegetation. This species is also present in villages, towns and big cities, nesting on monuments. It is found from sea-level to tree-line in mountains, with sites for perching, roosting and hunting. 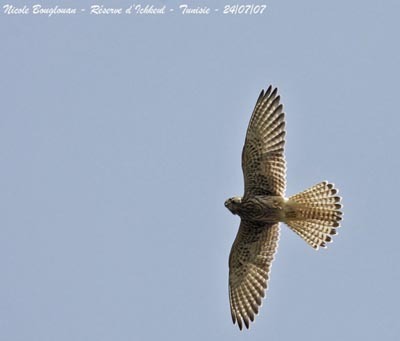 Common Kestrel breeds in Western Palaearctic, and in large part of Asia and Africa. 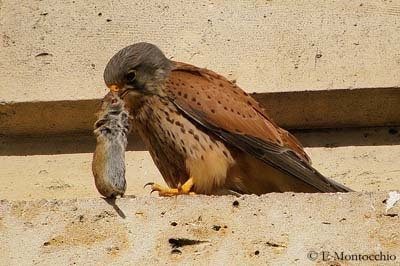 Common Kestrel feeds primarily on small mammals (voles, mice, shrews). It is able to catch some passerines in open areas but small numbers. However, it takes young birds when possible, and also lizards and insects. 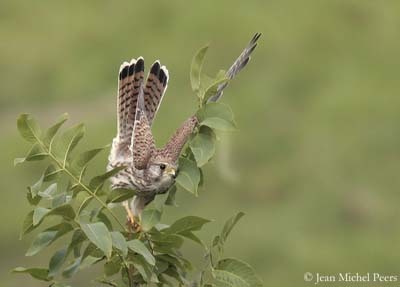 Common Kestrel hunts by performing low flight, but also from perch. When the prey is detected, it swoops down onto the prey in rapid short flight. This bird performs very typical hovering flight at height between 10 and 40 metres, carefully searching for prey on the ground. It may sometimes catch some flying insects, birds or bats on the wing. Common Kestrel performs some courtship displays, mainly aerial. It circles several times, feigning to attack the female on the ground. At this moment, she bows with raised tail and calls loudly. Other flight display shows the male performing flapping flight and glides, while it gives its typical “kik kik kik”, and then, it lands close to the female and copulation occurs. Pairs return to the same nest-site year after year. 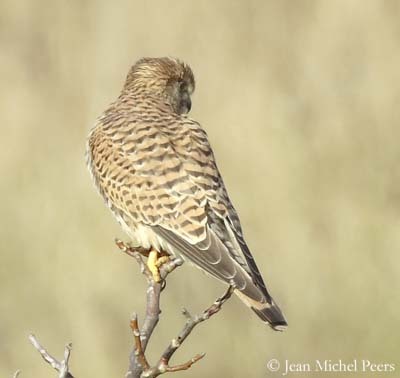 Common Kestrel is territorial and strongly defends its territory. It may chase larger raptors, harassing them until they fly away from the area. 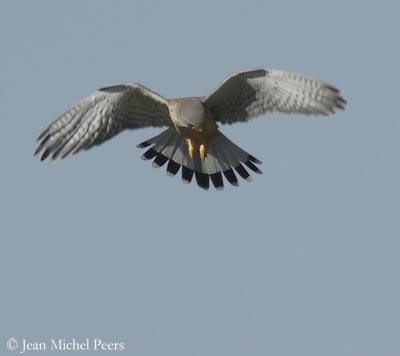 It is common to see the Kestrel chasing Booted Eagle, buzzard or large eagle. 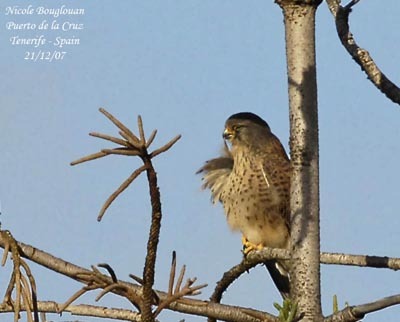 Common Kestrel is usually resident in its range, but some populations may perform dispersion. Young often disperse, even in resident population. 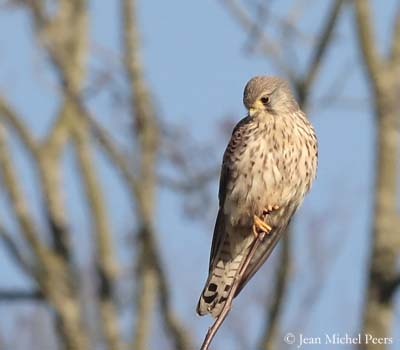 When hovering, Common Kestrel has distinctive silhouette with the wings tapering to a point. It often hovers when searching for prey, before to swoop down on it in short rapid flight. It is a powerful flier, performing rapid and gliding flight over long distances. Breeding season varies according to the distribution. Pair-bonds are probably for life, although the migratory birds often change of mate, but some pairs also migrate together. 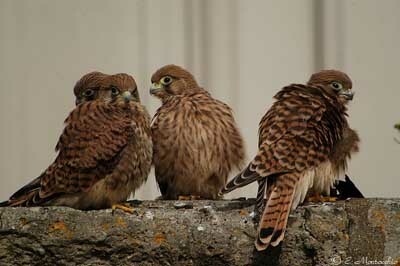 Common Kestrel usually nests in holes or ledges on cliff or rock faces, buildings or carries. It may also use holes in trees, such as abandoned nests of other birds, and mainly Corvids. It may sometimes nest in small colonies of up to some tens of pairs. Female lays 3-6 eggs at two days intervals. 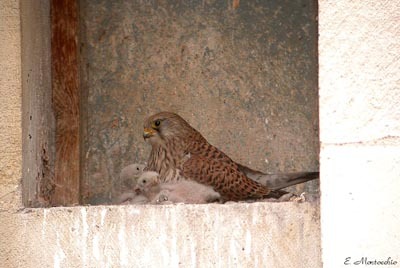 Incubation lasts about 27-30 days, by female which is fed by the male. 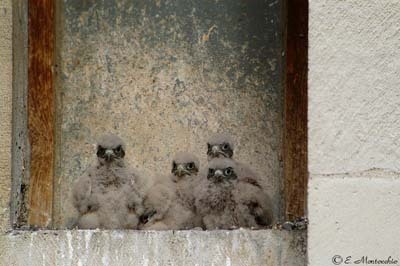 Chicks are fed by both parents and fledge about 27 to 35 days after hatching. But they still depend on parents for food during 2-4 weeks more. This species produces one brood per year, but replacement laying may occur if the first brood is destroyed. 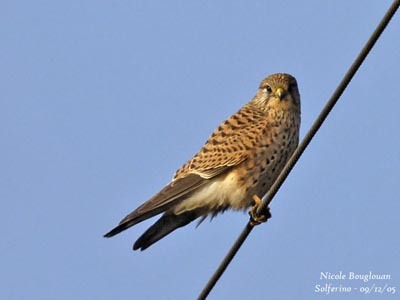 Common Kestrel is an efficient hunter feeding mainly on small mammals (voles, mice) which are about 90% of the diet. They are caught by hovering flight above the ground, waiting for the right moment before to swoop down onto the prey. It also consumes some passerines, lizards and insects. Common Kestrel is a common diurnal raptor throughout the range. Some declines due to pesticides occurred in the 1950’s and 1960’s, but populations recovered good numbers, thanks to the abundance of rodents. But some populations still are in decline.